Which reminds me: I’m still taking questions for Eva’s blogoversary character interview! Submissions will be accepted through 11:59 pm on Friday, July 3rd. Click here for details and to see which questions have been asked so far. Now, on to this month’s summary! Submit Your Questions for Eva’s Character Interview! Attending Writer’s Digest Conference 2015! Author contact cards are ready for #WDC15! June seemed to take on the theme of “pace yourself.” I was able to stay more relaxed by taking on only the projects I knew I’d have time for. 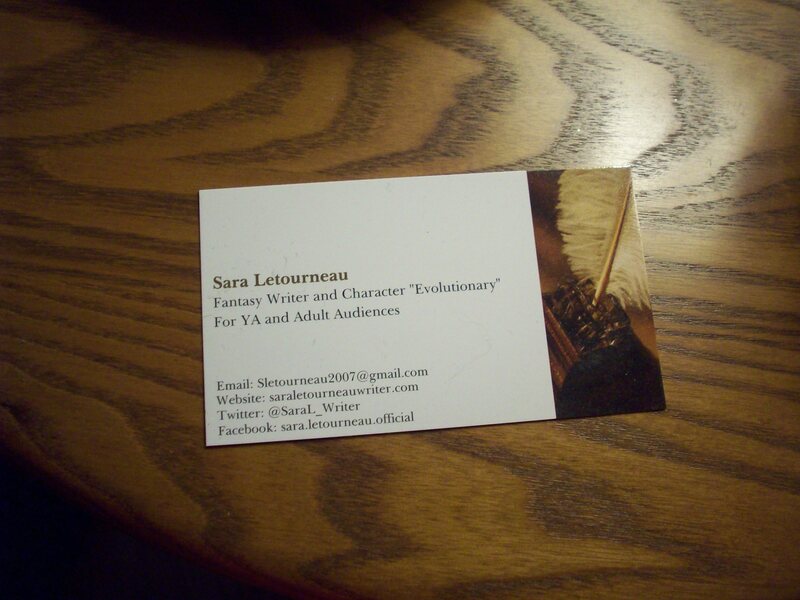 Apart from the writing, I made some simple updates to my author contact cards (see above photo), which I plan to bring with me to the Writer’s Digest Conference next month. Also, I ordered more tea samples from Adagio and decided on two more custom blends inspired by The Keeper’s Curse. One is an herbal blend representing Eva’s fellow Councilor Nito, who’s a healer. The other… is Eva’s tea!! Hers has been an absolute bugger to figure out, especially after my original idea bombed. So I’m thrilled that I’ve finally found something that a) fits her personality closely enough, and b) tastes pretty good. Speaking of TKC updates, I might change the frequency of this round of Chronicles from every 20-percent milestone to every 10-percent milestone. It might depend on how close the next milestone (30 percent) is to the Writer’s Digest Conference. So I might hold off on the next Chronicle until August regardless. Apart from writing, June was a family-oriented month. My maternal grandmother passed away a year ago this month, so I went with my parents to Maine one weekend to visit her grave and spend time with relatives. And this past weekend was Dad’s birthday, so I treated him to a New England Revolution game (which coincidentally fell on his big day – yay!). He’s a HUGE soccer fan, and I appreciate the sport as well, so it’s become a tradition to give him Revolution tickets for either Father’s Day or his birthday. Unfortunately the Revs lost (partly due to shoddy refereeing), but what matters more is that Dad still enjoyed the game. Finally, remember how I mentioned last month that I’m having bad-luck streak with new movies? It finally ended, thanks to “Tomorrowland”! Inspired by the Disney theme park of the same name, it tells the story of an idealistic, techno-whiz teenager (Britt Robertson) who stumbles upon a pin that acts as a portal to a futuristic city. When the girl realizes the portal is only temporary, she searches for a way back and enlists the reluctant help of an inventor (George Clooney) who had once been there himself. It’s not a perfect movie; some of the action borders on comical, and the ending feels a bit anti-climactic. But I liked the overall message and couldn’t stop laughing at the banter between the two main characters. And after seeing a dozen or so film that frustrated me, sitting back and having fun for once was a welcome change. Definitely catch “Tomorrowland” in theaters while you still can! I’m just catching up on your blog this morning, I guess! No way!! 😀 And yay for getting the opening paragraph down! What kind of story are you picturing atm? 😀 😀 😀 That sounds AWESOME, Leslie! And I love your story idea. Keep plugging away at it! Oh, Adagio. Their samples are the reason why I blend teas so much now because I got a chance to experiment first with their cheap samples. I use TrackChanges on a current version of the manuscript, using the comment boxes to label the date and time, which makes it quick and easy to double-check when stuff is added or deleted, how do you tackle it? In terms of the novel timeline… One of my “appendices” is a (massive) Microsoft Word table that I turned into a general historical timeline for Eva’s world. Any events related to TKC – both the novel’s plot points, anything that happened before (deaths of Eva’s parents, for example), and character birthdays – are listed there, as well as an estimated number of days, months, or years before or after the novel begins. I haven’t had to reshuffle the order of things yet… but if I needed to, the table is easy enough to update to match the story. Example of how it works: Chapters 1 through 3 all occur during the same day (Day 0). Chapter 4’s events take place four days later. So, the event in Chapter 4 is listed on the timeline as +4 days since Day 0. As for the deaths of Eva’s parents, that happened when Eva was 5 years old, roughly 12 years before TKC begins. So, that event shows up in the timeline as being 12 years before Chapter 1. Oh for sure:) It certainly sounds like you’ve got it all under control. My current method is one I’ve arrived at after a fair amount of trial and error. But I’ve friends who use index cards and a Excel spreadsheets. I think this is the glory about writing – it is such a very personal business that we all create our own process to get our ideas and creations out of our heads and onto the page. AND I’m in awe of your tea-blending hobby… I’d love to have a go, but I suspect I’d spend far too much time and money on it to the detriment of all the other calls on my time! Oh my word… I’ve made a HUGE effort and cut down my tea drinking as it was aggravating my insomnia and causing tinnitus. Since I’ve eased up, I’ve also found my eyesight has slightly improved! I also now use almond milk, instead of cows milk which is MUCH nicer – no claggy aftertaste so I can make my tea weaker. Do you take milk with your tea? Actually, I’m one of those weird tea drinkers who prefers no additives at all. *lol* Everyone else I know who drinks tea takes it with milk and/or sugar. Sweet business/contact cards and box of tea! And I also watched Tomorrowland, it was the tack-on movie at the double feature theater I went to, and I didn’t think much of it at first but I ended up really enjoying it. Pretty wild movie for sure! What a great (action packed) month you had. June put me into sloth mode for some reason, but you’ve inspired me to pick up the pace. Love the new cards. Thanks, Robin! Sometimes the summer weather has a (negative) effect on my productivity. But so far it hasn’t been too hot or muggy, and not too detrimental to motivation. How did summer start off where you live? Awesome!! Congrats on finally figuring out Eva’s tea! World-building hiccups–they happen. I’ve had a few, *blushes*. But hey, that’s what going through Draft 2 is for, right? 🙂 You can focus more on the story content and pick up on those things. I agree, that’s what Draft 2 is for, and also what sharing your story ideas is all about, too. Sometimes you’re so close to things and so excited about the project that you become blind to problems, glaring or minor. But I’ve talked it over with a couple friends, and I think I have a solution. It’s going to require a few significant changes to what happens in certain scenes (including one I already revised), but it doesn’t change the overall story too much. And when you’re a writer, you gotta do what you gotta do to ensure things make sense, right? Wow busy! But yay for increased blog stats and writing progress! Woo hoo! 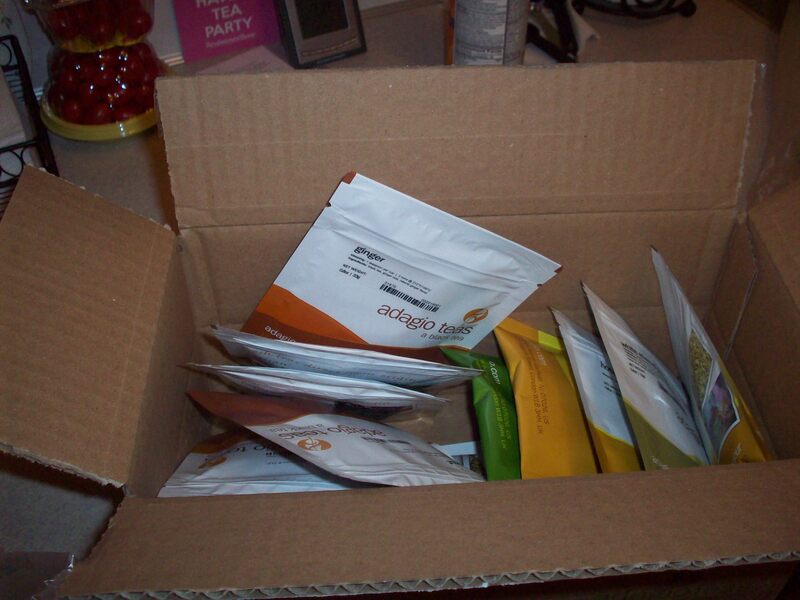 Yummy Adagio Teas! Yeshhhhhh! I need to order some soon myself lol. Haha, I had to. 🙂 That is absolutely one of my favorite sections of any metal song ever. It gives me chills every single time.